The opal is the official birthstone of October birthdays. It is generally identified by its milky surface that reflects every color of the rainbow. Opals can be very brittle and can dry out easily if not regularly exposed to moisture. For this reason, it is recommended that opal jewelry be worn often and close to the skin so that the stone can absorb some of the liquid from the skin. 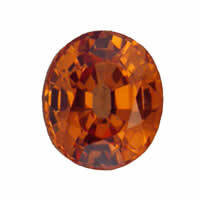 Sometimes the stone is oiled or coated with a protective resin in order to avoid cracking and breaking. In ancient times, opals were believed to bring good luck to the bearer. It was also believed that opals retained the properties of each color of gemstone that was reflected in its face. In the ancient Middle East, opals were a trinket of love and were thought to have been produced in the waters of Paradise. 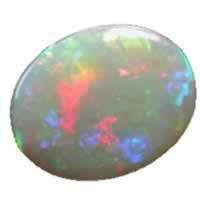 When wrapped in a bay leaf and held in the hand, the opal was said to give the bearer invisibility. In the ancient Aboriginal tradition of creation, the opal was indicative of the Creator's footsteps when he descended to Earth on a rainbow. Even today, opals are believed by some to have healing properties. Opals have been attributed to aiding in depression symptoms and helping the wearer to find and keep love. In modern astrology, opals are believed to have special characteristics for certain Cancers and Scorpios. Opals are formed as water drains through the earth picking up silica deposits, as this solution finds its way into natural cracks and fissures in the rock it fills the space. When the water evaporates it leaves behind deposits of silica, when this process is repeated over hundreds and thousands of years eventually an opal will be formed. An opal is a mineraloid gel that is made up primarily of silicon dioxide, the most abundant mineral in Earth's crust. This is the mineral that makes up common substances like sand, but under the right circumstances, can form into the opal, which is found most commonly in fissures and cracks in larger rocks. The chemical makeup of the opal is very high in water content, containing between three and five percent water molecules. This property, along with the fact that the opal itself does not have a crystalline structure, is responsible for the opal's classification as a mineraloid gel. An opal can be any color of the rainbow, from black to white and every color in between. The white milky opal is the most common, along with the green and blue opal, while the black and red versions are most rare, and therefore most precious. Some opals do have an interior structure that, while not crystalline, does provide some support for the gem and increases its diffraction abilities. Diffraction is the property that allows the opal to reflect every color of the rainbow. When light hits the interior structure of the opal, it is separated out into its individual color spectrums. The opal is Australia's national gemstone, which is appropriate because over 95% of the world's opals are mined there. Opals are also mined in Mexico (primarily the fire opal), Peru, the Czech Republic, Ethiopia, Turkey, Indonesia, Brazil, Idaho, and Nevada. 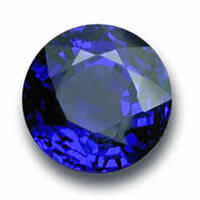 Nevada's state gemstone is the black opal. In 2008, NASA discovered opalline deposits on the surface of Mars.